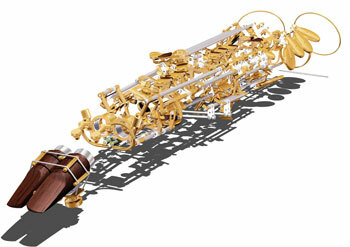 This new revolutionary mechanism is an enourmous step forward in woodwind instrument conception. The results are: reduced weight, reduced friction, increased response, and increased strength. It makes it possible for the repairman to operate on each key one by one without disassembling an entire rack of keys. It also dramatically reduces time needed for repairs, allowing a perfect adjusment of the pads in a few seconds. The mechanism uses standardized elements that favor mass-production efficiency and is adaptable to all woodwind instruments. Light and hard material (stainless steel) used for thin walled hollow key pipes and rods (1). 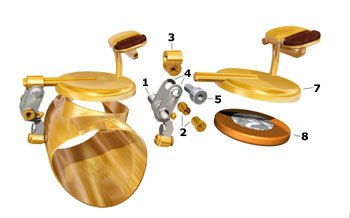 Replaceable end pieces (2) made of a low friction material (brass). Triple axis link joint (3) clamping the key cup, allowing instant positioning and adjustment of the pads. Angular plates (4) conecting the key pipes and the triple axis link joints with one single screw (5), allowing the use of shorter posts. Shorter and stronger tubular posts (6) which also work as resonaters. Regular key cups (7)using traditional pads (8). Reasonating pipes connecting thumb hook and thumb button to the body of the instrument. Extension of the normal range to the low A.